The Wikipedia article on ‘Earth’s energy balance’ has recently been updated with another figure by user ‘Cmglee’. It shows energy “in” from solar radiation, reflection, and energy “out” as heat into space. This is a more abstract, yet at the same time brillant and beautiful representation of the greenhouse effect figure, that appears twice in the same Wikipedia article, and that I have presented in posts some years ago (here and here). These more infographic-ish figures are all derived from the original Kiehl and Trenberth (1997) work, if I am not mistaken. Cmglee’s visualization reminded me of a bundle of ropes suspended at two points. Ropes of different diameter, of course, as it is common in Sankey diagrams. See more of Cmglee’s artwork here. 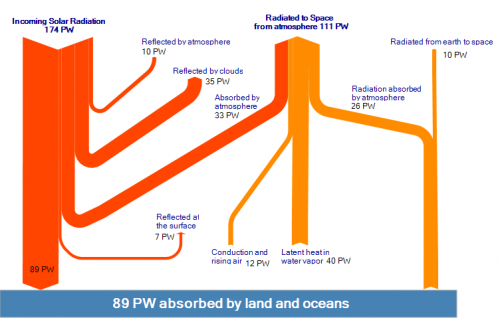 This diagram of sun radiation being absorbed and reflected when hitting earth (from Solar Energy Facts website) is a rather weak remake of the original Nasa diagram. I find the floating powerpointish arrows kind of disturbing, and with the arrow magnitudes not to scale, would even call it misleading. Took the time to prepare two new versions of it (actually I am beta testing the new version 2.0 of e!Sankey at the moment – so this was a nice little test case). The first version sticks more to the original idea of the diagram shown above, but the arrow magnitudes are corrected and to scale. 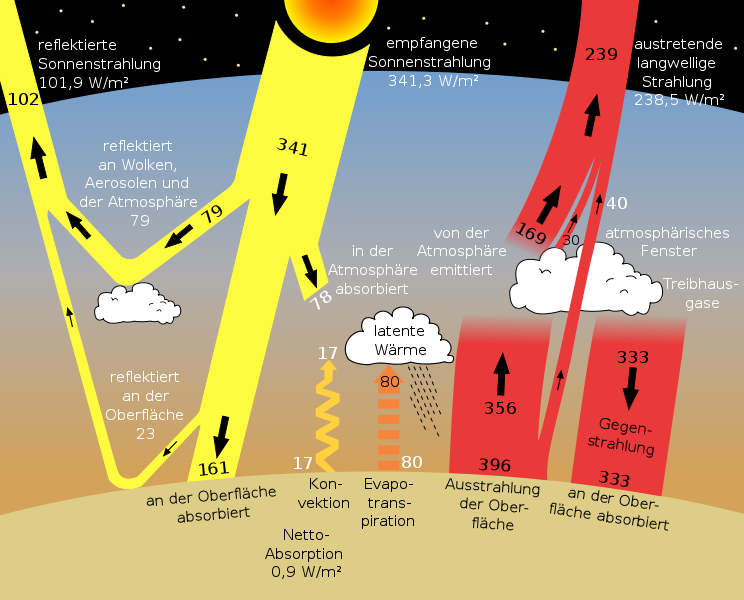 The second version is closer to the original ‘Breakdown of the incoming Solar Energy’ diagram by User A1 that can be found on Wikicommons. 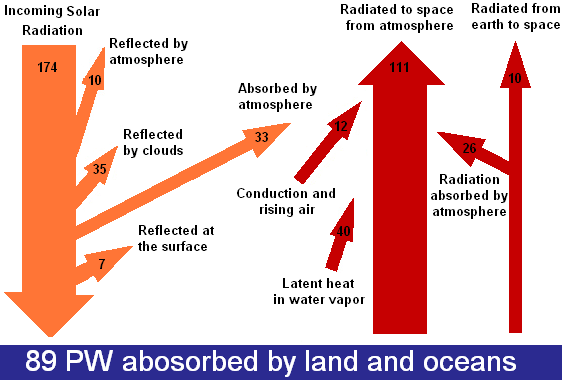 The latter one has the flow for energy being absorbed by atmosphere (33 PW) branching off as the first arrow horizontally. 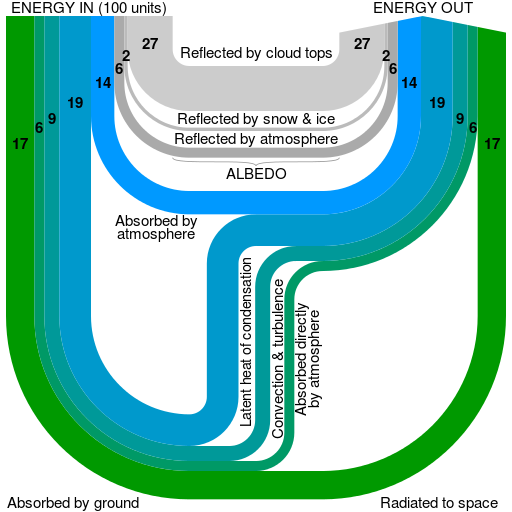 On Wiki Commons I discovered a different Sankey diagram image for the greenhouse effect than the one I presented in a previous post. 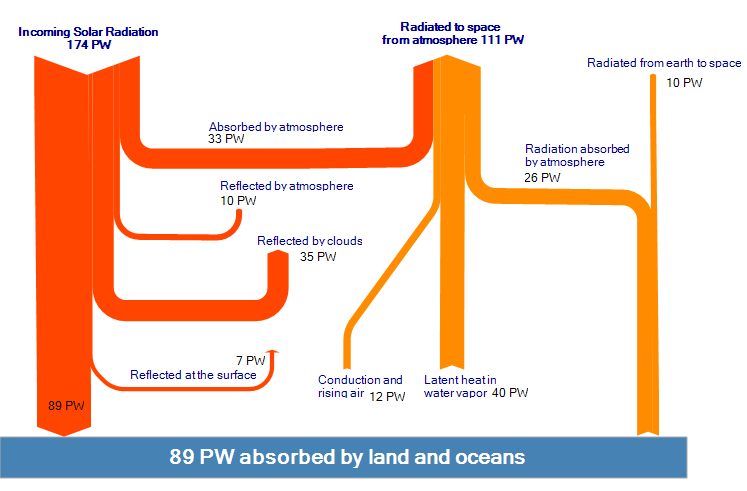 The diagram is titled ‘sun climate system’, which seems appropriate. The values are in Watt per square meters. Labels are in German, but if you want to know what they mean, just go to the original Earth Observer (Nov/Dec 2006 Vol. 18 Issue 6) PDF file by NASA and check out page 38.